Can you believe that it’s been a year since the first Homeschool Thursday?! Do you remember when we shared that amazing resource with you guys? We put in our Water Cycle Bundle and it was such a success. Actually, the whole Homeschool Thursday resource had over 9000 sign ups! That’s amazing! I’m so excited to tell you guys that we’ve participated again this year, throwing in our Bible Trivia for Kids Game (a $15 value- FREE)! But that’s not all! 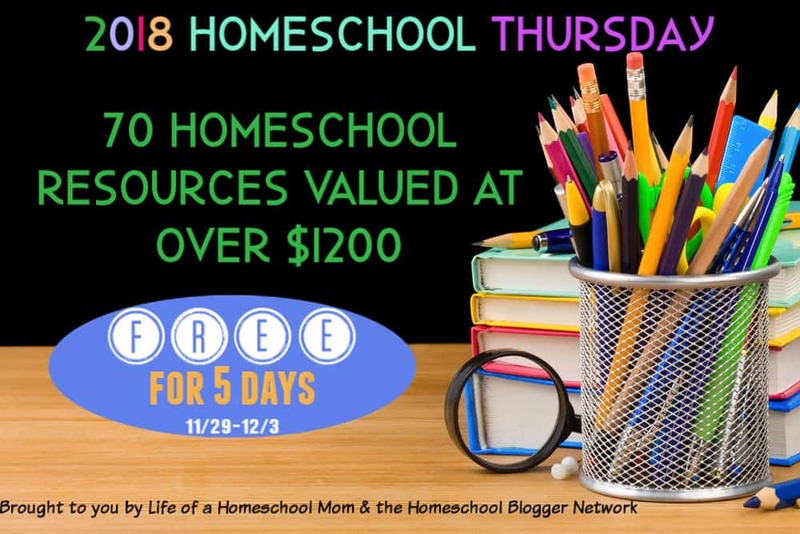 There are over 70 free homeschool resources in this packet that is valued at over $1200! Just like all good things, this also must come to an end. All of the free homeschool resources comprised in the bundle are ONLY available for 5 days. After Monday, 12/3/18, it is gone for EVER! If you’re homeschooling, if you plan to homeschool, if you know someone who homeschooled- this is for you! There are a few minor changes that come with a new year of Homeschool Thursday, one being that you can opt-in to get all the resources, or you can just sign up for the resources that you want- meaning that you won’t be spammed with everything that you DON’T want. Really though, I’m sure that you, or someone you know, will find value in every single piece of this collaboration of free homeschool resources by some of the best bloggers out there. Most of these bloggers come right from the Homeschool Blogging Connection Team, just like me! The resources are categorized by Preschool/Elementary, Middle/High School, Multiple Ages, Resources for Moms, Holiday/Seasonal. 70+ resources from homeschool bloggers. Products include eCourses, eBooks, Video courses, curriculum, worksheet packs, planners, unit studies, wall art, games, copywork, Bible studies, chore systems, subscriptions, and more! Don’t forget, if you’re okay with filling out multiple forms, then I suggest that you sign up to download whichever products interest you. BUT, I strongly suggest that you fill out the one opt-in form and only download the resources that fit your family/style. These resources will never be available again to download in a single place. This is a one time offer. After that, you’ll have to find each of these free homeschool resources on your own, and then they probably won’t be free anymore either! Looking for a community of women to stand with you throughout your journey in motherhood and homeschooling? Don’t forget to join our FREE Facebook Group for Christian Homeschoolers. « 10 Online Modest Clothing Boutiques that won’t disappoint!